Ever wanted to travel on the Silk Road? That's what we decided to do in August 2005 during 1 month. Wonderful places which you only heard of in oriental tales. Very nice and friendly people. Stick with local guides and try to avoid the large tourist groups that come in large buses and only visit the highlights in the speed of light. Food? Excellent except in Turkmenistan where it was honestly the worst we ever tasted. In August 2004 we decided, during our holidays in South Korea, to do a short trip to China where we visited some of the highlights. At the end we came to the conclusion that, yes, Chinese food is the best of the world. Don't go to tourist restaurants (you will get the same stuff as at home) but try the many local restaurants even if they don't look very clean. The communication is no problem: Just look around what the others guests are eating, grab the waiter, and point to the dishes that please you. It can be very funny but we were never deceived. La raison majeure pour les embouteillages sont la non-observation des conseils de la sécurité routière. Notamment dans le cas d'un chantier sur autoroute ou dans l'approche d'un rond-point. Êtes-vous chauffeur ou plutôt chauffard? 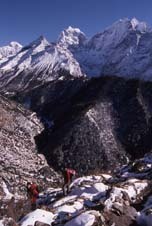 Our first Himalayan trek at the end of December 2003. From 2800m starting at Lukla to 4800m to Gokyo and back in 12 days. The initial setup of the new homepage has been completed. Every migration takes time and so we will start bit by bit to copy the info of the old website over to this one.